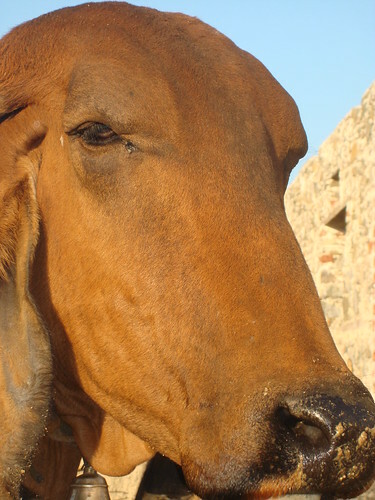 Profile of a cow kept by the Rajasthani agro-pastoralists who have inhabited India’s state of Rajasthan (‘land of kings’ or ‘colours’), from the Great Thar Desert in the northwest to the better-watered regions of the southeast, since parts of it formed the great trading and urban Indus Valley (3000-500 BC) and Harappan (1,000 BC) civilizations (photo credit: ILRI/Susan MacMillan). We know that livestock produce significant amounts of greenhouse gases. Just how much remains somewhat contentious, with the estimated contributions of livestock to global greenhouse gas emissions ranging from 10 to 51%, depending on who is doing the analyses, and how. A new commentary, published in a special ‘animal feed’ issue of the scientific journal Animal Feed and Technology, examines the main discrepancies between well known and documented studies such as FAO’s Livestock Long Shadow report (FAO 2006) and some more recent estimates. The authors of the commentary advocate for better documentation of assumptions and methodologies for estimating emissions and the need for greater scientific debate, discussion and scrutiny in this area. The authors of the new article, ‘Livestock and greenhouse gas emissions: The importance of getting the numbers right,’ are a distinguished group of experts from diverse institutions working in this area, including the Food and Agriculture Organization of the United Nations (FAO, Rome), Wageningen University and Research Centre (Netherlands), the Food Climate Research Network at the Centre for Environmental Strategy (FCRN, University of Surrey), the European Commission’s Joint Research Centre at the Institute for Environment and Sustainability (JRC, Italy), the Netherlands Environmental Assessment Agency (PBL, Bilthoven), Aarhus University’s Department of Agroecology and Environment (Denmark), New Zealand’s Ministry of Agriculture and Forestry (Wellington), the Institute Nationale de la Recherche Agronomique (France), the Agriculture and Agri-Food Canada group at Lethbridge Research Centre (Alberta) and the International Livestock Research Institute (ILRI, Nairobi). This group of international scientists presents the case of one recent argument as follows. ‘In 2006, the FAO’s Livestock’s Long Shadow report (FAO, 2006), using well documented and rigorous life cycle analyses, estimated that global livestock contributes to 18% of global GHG [greenhouse gas] emissions. According to the study the main contributors to GHG from livestock systems are land use change (carbon dioxide, CO2), enteric fermentation from ruminants (methane, CH4) and manure management (nitrous oxide, N2O). Mario Herrero, lead author of the Animal Feed and Technology paper, is a systems analyst and climate change specialist working at the International Livestock Research Institute (ILRI). Herrero argues that Goodland and Anhang, while claiming in the non-scientifically peer-reviewed World Watch Magazine (which is published by Worldwatch Institute) that livestock generate 51% of total anthropogenic greenhouse gas emissions rather than the 18% reported by FAO in 2007, fail to detail the methodologies they used to come up with this new figure, fail to use those methods consistently across different sectors, and fail to follow global guidelines for assessing emissions set by the Intergovernmental Panel on Climate Change and Kyoto Protocol. Furthermore, Hererro says, the World Watch authors’ solution to livestock’s contribution to global warming—’to eat less animal products, or better still, none at all’—could push some 1 billion livestock keepers and consumers living on little more than a dollar a day into even greater poverty (small livestock enterprises are the mainstay of many poor people) and severe malnourishment (milk is among the few high-quality foods readily available to many poor people, with consumption of modest quantities of dairy making the difference between health and illness, especially in children and women of child-bearing ages). Goodland and Anhang also fail to enlarge on any counterfactuals, such as what a world without domesticated livestock would look like. Over a billion people make a living from livestock, says ILRI director general Carlos Seré. Most of them are among the poorest of the poor. What, other than livestock keeping, would most African and Indian farming households turn to in order to meet their needs for scarce protein, fertilizer, employment, income, traction, means of saving, and insurance against crop failure? While many of us may find the factory farming of animals in rich countries objectionable on several grounds, Seré says, we must be responsible not to conflate industrial grain-fed livestock systems of rich producers with the family farming and herding practices of hundreds of millions of poor producers, most of whom still maintain their animals not on grain but on pasture grass and other crop wastes not edible by humans. The biggest concern of many experts regarding livestock in developing countries, Seré says, is not their impact on climate change but rather the impact of climate change on livestock production. The hotter and more extreme tropical environments being predicted threaten not only up to a billion livelihoods based on livestock but also supplies of milk, meat and eggs among hungry communities that need these nourishing foods most. For people living in absolute poverty and chronic hunger, the solution is not to rid the world of livestock, but rather to find ways to farm animals more efficiently and profitably, as well as sustainably. Tara Garnett, a co-author of the new paper and a research fellow at the Centre for Environmental Strategy at the University of Surrey, in the UK, investigates issues around livestock and greenhouse gas emissions in her highly credible and readable publication Cooking up a Storm: Food, Greenhouse Gas Emissions and Our Changing Climate (2008). Garnett, who also runs the Food Climate Research Network (FCRN), which brings together nearly 2,000 individuals from a broad variety of disciplines to share information on issues relating to food and climate change, agrees with Seré on this. By 2050, on current projections, Garnett reports, the developing world will still, on average, be eating less than half as much meat as people do in the rich world, and only a third of the milk. There is a long way to go before they catch up with developed world levels. Herrero and Garnett and their other co-authors conclude that ‘Livestock undoubtedly need to be a priority focus of attention as the global community seeks to address the challenge of climate change. The magnitude of the discrepancy between the Goodland and Anhang paper (2009) and widely recognized estimates of GHG from livestock (FAO, 2006), illustrates the need to provide the climate change community and policy makers with accurate emissions estimates and information about the link between agriculture and climate. ‘Improving the global estimates of GHG attributed to livestock systems is of paramount importance. This is not only because we need to define the magnitude of the impact of livestock on climate change, but also because we need to understand their contribution relative to other sources. Such information will enable effective mitigation options to be designed to reduce emissions and improve the sustainability of the livestock sector while continuing to provide livelihoods and food for a wide range of people, especially the poor. We need to understand where livestock can help and where they hinder the goals of resilient global ecosystems and a sustainable, equitable future for future generations. Read the whole post-print paper by Mario Herrero, P Gerber, T Vellinga, T Garnett, A Leip, C Opio, HJ Westhoek, PK Thornton, J Olesen, N Hutchings, H Montgomery, J-F Soussana, H Steinfeld and TA McAllister: Livestock and greenhouse gas emissions: The importance of getting the numbers right, a special issue on ‘Greenhouse Gases in Animal Agriculture—Finding a Balance between Food and Emissions’ published this month in 2011 in Animal Feed Science and Technology 166–167: 779–782 (doi: 10.1016/j.anifeedsci.2011.04.083). Read the Goodland and Anhang article in World Watch Magazine: Livestock and Climate Change: What if the key actors in climate change are…cows, pigs, and chickens? November/December 2009. 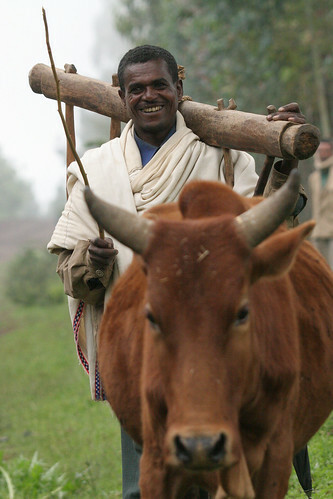 Samuel Adugna carries his wooden plough out to his fields for a day’s work with his two oxen near Wenchi town, in the Ethiopian highlands (photo credit: ILRI/Mann). State of the World, the flagship annual publication from the Worldwatch Institute (Nourishing the Planet), this year focuses on 15 agricultural innovations that can nourish both people and their environments. Sustainable livestock production in developing countries is included as one such solution. ‘For over 40 years, Earth Day has served as a call to action, mobilizing individuals and organizations around the world to address these challenges. This year Nourishing the Planet highlights agriculture—often blamed as a driver of environmental problems—as an emerging solution. ‘Agriculture is a source of food and income for the world’s poor and a primary engine for economic growth. It also offers untapped potential for mitigating climate change and protecting biodiversity, and for lifting millions of people out of poverty. Read the whole article, which is cross-posted on the websites of the Huffington Post and Worldwatch Institute’s Nourishing the Planet: Agriculture: The unlikely Earth Day hero, 19 April 2011. Read the whole livestock chapter in the State of the World. Purchase the book, State of the World 2011: Innovations that Nourish the Planet, in which this and 14 other solutions are described and watch a one-minute book trailer. State of the World 2011 provides new insight into under-appreciated innovations working right now on the ground to alleviate hunger (photo credit: Worldwatch Institute). This week Worldwatch Institute released its flagship publication, State of the World 2011: Innovations that Nourish the Planet. The report spotlights successful and efficient ways of alleviating global hunger and poverty. Agricultural systems analyst Mario Herrero and other staff of the International Livestock Research Institute (ILRI) are the authors of Chapter 14, ‘Improving food production from livestock’. While investment in agricultural development by governments, international lenders, and foundations has escalated in recent years, it is still nowhere near what is needed to help the 925 million people who are undernourished. Since the mid-1980s when agricultural funding was at its height, agriculture’s share of global development aid has fallen from over 16 per cent to just 4 per cent today. ‘The international community has been neglecting entire segments of the food system in its efforts to reduce hunger and poverty,’ said Danielle Nierenberg, co-director of Worldwatch’s Nourishing the Planet project. State of the World 2011 draws from hundreds of case studies and first-person examples to offer solutions to reducing hunger and poverty. The State of the World 2011 report is accompanied by other informational materials including briefing documents, summaries, an innovations database, videos, and podcasts, all of which are available at www.NourishingthePlanet.com. In conducting this research, Worldwatch’s Nourishing the Planet project received unprecedented access to major international research institutions, including those like ILRI in the Consultative Group on International Agricultural Research. The team also interacted extensively with farmers and farmers’ unions as well as with the banking and investment communities. This report was produced with support from the Bill and Melinda Gates Foundation. Early in the trip she visited the ILRI campus in Addis Ababa; she has subsequently been in Kenya, Uganda, Tanzania, Mozambique, Zambia and South Africa … reporting on the project blog. This month, Danielle’s blog includes a profile of ILRI’s Alan Duncan, member of the project’s advisory group.